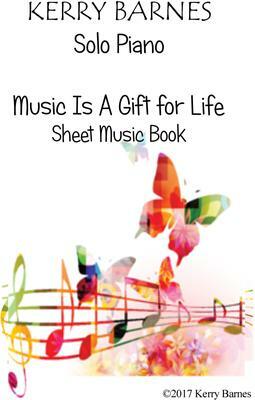 The Complete Piano Sheet Music Book to accompany the CD 'Music is a Gift for Life' by British Composer Kerry Barnes. 14 beautiful piano pieces to treasure. Moderate difficulty, very playable for any amateur or more advanced piano players. A new book for 2017!! A magical musical journey for your very own pleasure, comprising of contemporary classical and new age works. Sophisticated easy listening. Enjoy!! What do you want to know about Music Is A Gift For Life?